This chilling psychological suspense novel--think Strangers on a Train for the modern age--explores the dark side of love and the unbreakable ties that bind two sisters together. Callie, Tilda's unassuming twin, has watched her sister visibly shrink under Felix's domineering love. She has looked on silently as Tilda stopped working, nearly stopped eating, and turned into a neat freak, with mugs wrapped in Saran Wrap and suspicious syringes hidden in the bathroom trash. She knows about Felix's uncontrollable rages, and has seen the bruises on the white skin of her sister's arms. Worried about the psychological hold that Felix seems to have over Tilda, Callie joins an Internet support group for victims of abuse and their friends. However, things spiral out of control and she starts to doubt her own judgment when one of her new acquaintances is killed by an abusive man. And then suddenly Felix dies--or was he murdered? A page-turning work of suspense that announces a stunning new voice in fiction, White Bodies will change the way you think about obsession, love, and the violence we inflict on one another--and ourselves. Tilda and Callie are twins. Tilda being the successful, outgoing one with Callie living in her shadow and seemingly obsessed. When Tilda meets Felix, Callie is brought into their world... but things don't seem right. Tilda seems to change, losing weight, acting strangely and her normally messy self becomes obsessively neat under Felix's influence. Callie starts to think something is wrong and joins an online support group as she's concerned about Tilda's welfare. Is she imagining what is going on or is something really wrong? A story told strictly through Callie's eyes, we get a full on education on her thoughts and feelings as she struggles with her own inner demons while trying to understand Tilda's. There is not a single likable character and the reader also begins to wonder what is going on. 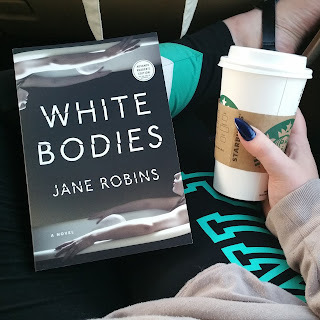 Psychological thrillers are one of my favorite genres to read. This one delves into the dark side of relationships, not only with a romantic partner, but with a sibling. How far would you go to help the ones you love? This book is quite the interesting read. It's disturbing with a bit of a Single White Female vibe in the obsession of Callie with Tilda. 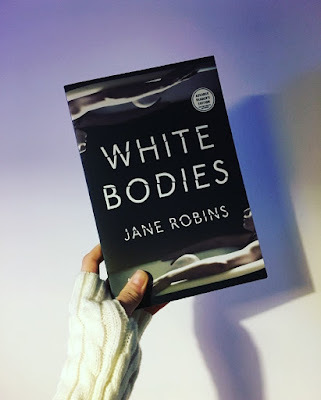 If you love the dark mind that psychological suspense thrillers bring then this is one you should definitely add to your TBR pile. The little nuances are what makes the book special rather than any huge revelation. I found this to be a bit of a slower pace but still a quick read and delving more into the psychological warfare your mind can take you to rather than big actions. Dig in.. get twisted. Nothing beats a great psychological thriller. I will say, it was kind of funny to me picking this one up for the simple fact that my mom's name is Jayne Robins. Definitely confused me at first! 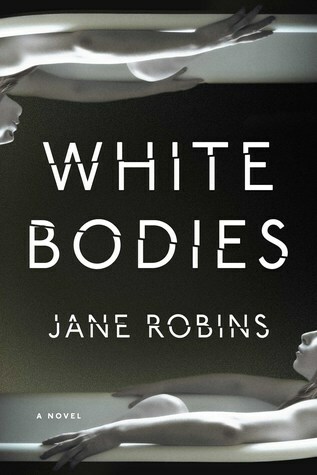 WHITE BODIES by Jane Robins is the perfect domestic thriller about a couple and the lengths a twin sister will go to protect the other. Felix and Tilda have the seemingly perfect relationship, but in the privacy of their own home he controls every aspect of her life. Tilda has stopped working, stopped eating, and has turned into something of a neat freak. Callie watches on helplessly as her sister deteriorates and she's no stranger to Felix's fits of rage because she sees the evidence on her sister's beautiful skin. Callie wants to save her sister and she joins an online support group for victims of abuse. When Felix turns up dead, Callie begins to question what is real and what is in her head. This is told from Callie's perspective and Robins really brings the reader deep into her mind. It keeps the reader guessing and not quite knowing what is reality. 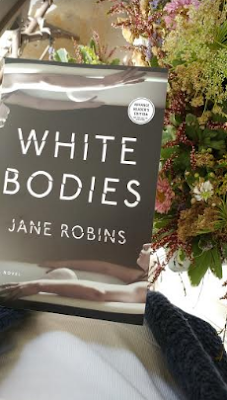 The psychology behind the relationships of twins is always intriguing to me and it's a subject I love having in psychological thrillers (especially when it's done right!). Overall, if you want an unsettling and unnerving psychological thriller about how far one sister will go to save her twin, then you need to read this one! Even though it's a common topic in thrillers, Robins does this in a unique way and makes it stand out from the rest. It is a slower build but it was still an addictive read. I am such a sucker for a psychological thriller; I am always on the hunt for something new that will leave me thinking. Enter, White Bodies by Jane Robins, a book that topped by fall TBR list and one that I was eagerly anticipating. Chandra, Jessica and I added this one to our September TBR pile months ago so I was incredibly excited to dive in. The story begins and develops your typical love story: man (Felix) meets girl (Tilda), man controls girl, twin sister of girl (Callie) gets mad, man ends up dead. Ya know, the stuff that makes ya warm and fuzzy inside. I loved how Robins slowly built and weaved the tension throughout the plot; it truly left me feeling unsettled. Especially in regards to the Callie character. What a treat she was. A completely disturbing and pretty messed up treat, but a treat nonetheless! I think one of the first “um…WTF Callie?? !” moments comes at about 13% into the book. I don’t think I will ever look at a pair of twins the same!! I also felt like the writing style of this one was incredibly different; the premise is like other books I have read but the execution felt more original. The story does not follow a specific linear path; instead, it focuses on alternative narrative moments in time between the present and then two different snapshots from the past. I think my favourite (is that okay to say something was my favourite when it was so twisted) were the Callie chapters from her childhood. Creepy. My biggest complaint with this novel was the pacing. I felt like the first 100 pages or so really dragged. I was interested. I wanted to keep reading but I didn’t find myself tearing through the pages. However, the second half of the book really shone and I did find myself completely engrossed. I guess I wish it had paced more evenly so I felt entirely dedicated throughout. I also had a hunch regarding the “reveal” fairly early on, but that didn’t deter me from completing the novel. I loved Robin’s style. Overall, if you want a psychological thriller that will give you the creeps, then I would pick this one up. It is totally worth the read. Big thank you to Touchstone Books for these copies in return for our honest opinions.